Well, I've been in Lemelson. I've been assembling swords. Sword-of. My friend Jack has been stopping by and I've been helping him assemble HIS sword, which is a learning experience for both of us. I built a blade-tempering bath using a long, trough-like object to hold the vermiculite from the "annealing bucket" we have for tool-steel items like knives and, well, tools, which my friend was successfully able to use. However, I've also had several other projects on. Two of these projects are thanks to Freya for her exhibition of Viking artifacts beginning tomorrow in the Library Gallery. 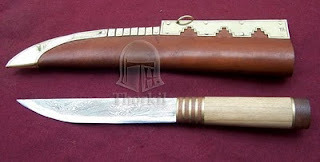 The first is the seax that I forged a few weeks ago. 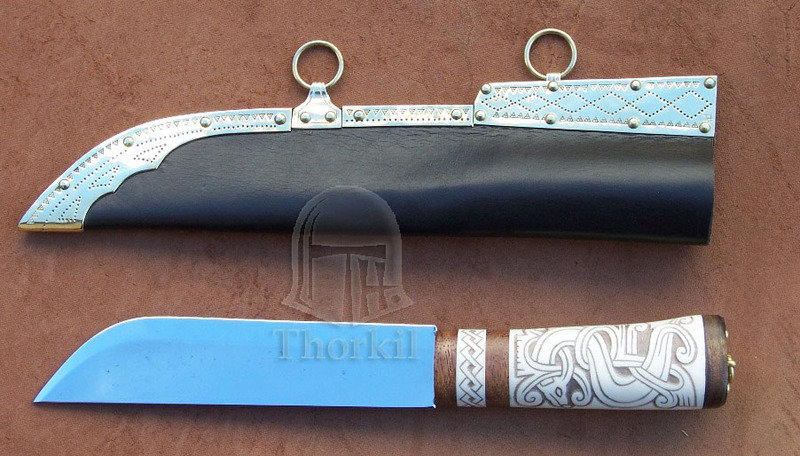 Having finished smoothing and shaping the blade, I knew the time had come to begin making a handle and a scabbard. 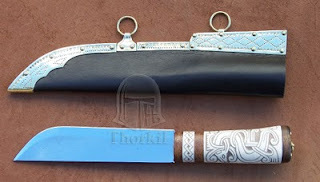 I began by scouring the internet and visiting the sites of well-known seax-makers in the bladesmithing and Viking technology community, such as Thorkil and Petr Florianek (both hailing from eastern Europe, as many skilled bladesmiths seem to). I was inspired by pictures such as those above and below. I've been working on another project for Freya too, and that's a Viking shield. It's taken up most of my time but I relish the challenge and since I have some woodworking experience I feel more adept at it, even if I'm still learning and making something new. I plan to make many more shields in the future. I started with six 1/2" poplar boards 42" long and 5.5" wide. I used a table joiner to smooth down the edges and butted them together with wood glue and clamps. I then realized that I wanted the shield thinner based on statistics from this authoritative source. I spent a few hours hand-planing both sides of the shield, which I had now cut into a circular shape. I cut a hole in the shield thereafter for where one grips the handle, which will be an iron bar running the length of the shield perpendicular to the wood grain. The bar will be vertical when the shield is wielded, and on the same side of the shield as the person it's protecting. On the other side of the shield opposite the handle will be the steel boss, which I dished and planished cold. I designed a Viking-style motif to emblazon the front side and transferred it onto canvas, which I glued to the front of the shield (historically precedented). However, the glue on only one side engorged the fibers of the wood, causing severe warping. I am currently trying to correct this by applying glue to the opposite side and putting heavy stuff on it. I'll check it in half an hour; it's been sitting the weekend!